Last week I was honored with a nomination for the Very Inspiring Blogger Award by swajithkas. 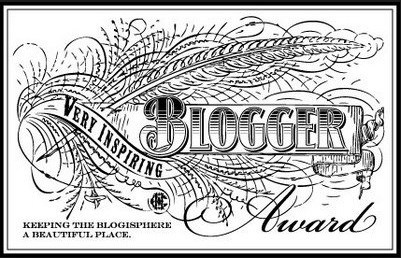 Thank you so much for nominating me along with 14 other inspiring bloggers for this award! I’m still just getting over the shock from my first award, let alone this one. Thank you again so much and I’m grateful that you enjoy my blog! Now, as always, onto the rules. Nominate 15 other bloggers and notify them of their nomination. I actually enjoyed reading the Twilight books, but the movies ruined the entire series for me altogether. I prefer to play sports over watching them (with the exception of watching football). I use the word “actually” way more often than I should. I am very indecisive (as you can tell by my using “actually” too much). My eyes are green, however they can appear blue when I wear certain colors. I have fallen in love with a few fictional characters from a few different books. I’m still not over a few deaths that occurred in Harry Potter (especially Fred, Dobby and Hedwig). And there you have it folks! Fifteen more amazing and inspiring blogs you should check out. That’s so funny about your eyes! I have blue eyes, but depending on what I’m wearing or my mood, one randomly turna green! Once again congratulation for your Nomination; because, you truly deserve it. Because, since last month, I am following your blog and believe me to read your each and every post is one of the most important task of my schedule; though, still, I have not gone through each post, but whatever, I have read till today, I am enjoying it very much. As a human being you are wonderful person, the person ” one can cry and die for the person as a friend”, yes, believe me, many a times, I consider myself fortunate that I know you and we are communicating with each other more often. Do I need to say “Wishing you all the best” no, because, where you are and where you will be my well wishes along with “Grace of God” will be always with you………………..
Oh WOW!!! Congratulations, Tabitha. I just stopped by to pay you a visit, and noticed that you nominated me for this award. Thank you for such a kind gesture. I will do my best to complete my acceptance post in a timely manner linking back to your blog. Again, congrats!! !